In mid-September, Japan had two typhoons pass through, with some areas receiving double their average rainfall for September in just over a week. With a forecast of more rain, it was a no brainer to head out of Tokyo to the beach when Saturday dawned bright and clear. Araihama beach is situated on the Miura penninsula, about 90 minutes drive from Tokyo. It has a protected cove, which makes it ideal for children to swim and play. We ate lunch at Kamehameha, the Hawaiian restaurant on the beach, where everything (even the music) had a Hawaiian theme. 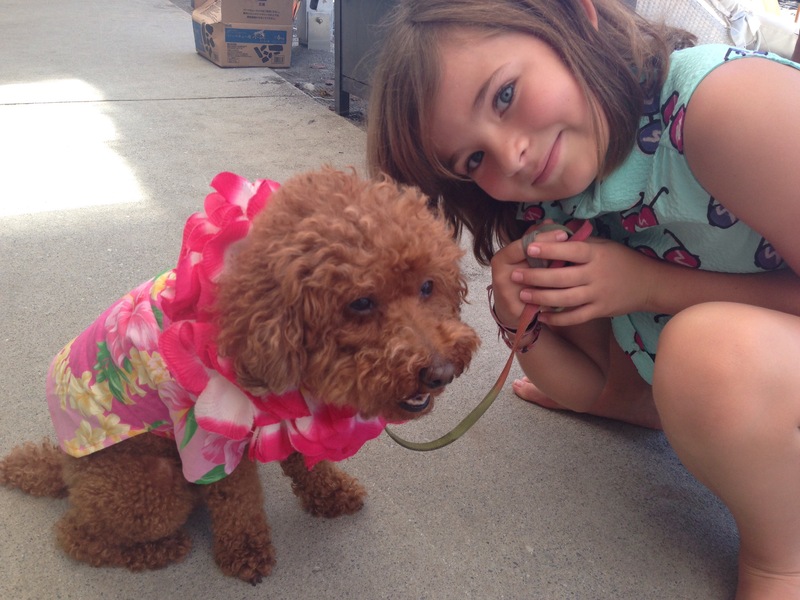 Even the dog was in a hawaiian outfit! The proprietors were very friendly and spoke an element of English. 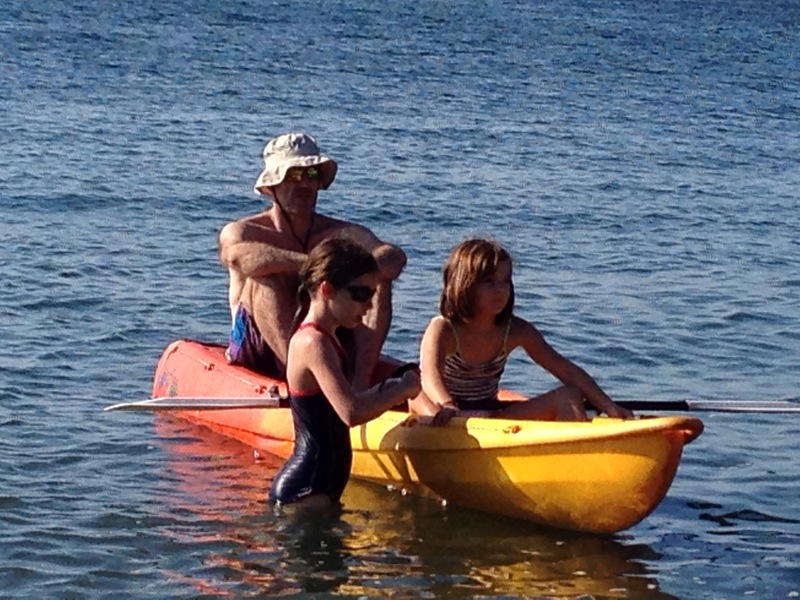 They also had various water sport equipment which we were able to borrow. The Hawaiian restaurant and the others on the beach, offered a BBQ option. It requires at least 1 1/2 hour advanced reservation, and then the BBQ and all the food is provided. The whole beach was filled with delicious smelling aromas, and we never felt smoked out, despite having a group BBQ-ing next to us. We first visited Araihama last May and stumbled across a festival. The beach was closed off and there were lots of people around. Someone, eventually explained to us that it was a ceremony to commemorate the souls of the Miura clan, who died out in the Muromachi period. It is held at Araihama beach on the last Sunday in May each year and the festival includes Kasagake ―old archery and horsemanship techniques passed down from the Miura clan. Basically the samurai gallop their horses along the beach where they have to aim at a wooden target. If they hit the target, it is considered good luck. The splinters are collected and for a fee, signed with your surname at the end of the festival. They are supposed to bring good luck to your house. The festival was fascinating and well worth a visit. We drove down to the penninsula on both visits, parking at the Keikyu Aburatsubo Marine Park, which is Y700 for the day. The drive was relatively straight forward, and I believe just as easy to get there on public transport as there was a bus terminal not far from the beach. This entry was posted in Good days, Tokyo, Tokyo with kids, Travel and tagged Araihama beach, exploring, Miura penninsula, sunshine. Bookmark the permalink.